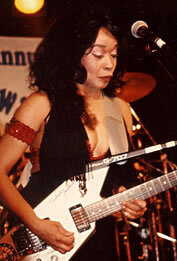 LADY BO, FIRST LADY OF R&R BLUES AND QUEEN MOTHER OF GUITAR, AN AMERICAN LEGEND! Born Peggy Jones, the woman that would come to be known as Lady Bo bought her first guitar in 1955, at the age of 15, and met up with Bo Diddley a year later, becoming his first of several guitar-slinging female sidekicks. Playing on Bo's recordings of "Hey, Bo Diddley," "Mona," "Say Man," "Crackin' Up," "Road Runner," "Bo Diddley's A Gunslinger," and the jaw-dropping "Aztec" and "Lady Bo Live," in 1962 she moved onto studio work that found her kickin' up a ruckus on hits by the Bopchords and the Continentals, but most notably Les Cooper ("Owee Baby") and the Soul Rockers' crazed smash "Wiggle Wobble" (King Curtis on sax) backed with "Dig Yourself." She later spent time in the rhythm sections of James Brown's and Sam and Dave's bands and, not surprisingly, was heavily influenced by the Latin rhythms of Mongo Santamaria. Lady Bo sent the Mau Mau this live recording of her reworking of the classic "I'm Sorry"- "Say That You Love Me" at Monterey Bay Blues Festival.